Notice: ACM is working with the Allegany County Health Department to hold an H1N1 vaccination clinic for students who are at high risk to becoming ill to this particular virus. The clinic depends upon the availability of the vaccine; therefore, specific details are not available at this time. Keep checking this webpage for up to date information on H1N1 and any scheduled vaccination clinic. As you know the H1N1 virus continues to spread. We now have our first confirmed case on campus within the student body. Please realize there is no need to panic. We understand the threat of this virus and will continue to monitor it on campus and in the region by working closely with public information groups in Allegany, Somerset, and Bedford counties. As new information becomes available to us from these groups, we will keep you posted through this webpage. Wash your hands often with soap and water and always practice good hygiene. Know the signs and symptoms of the flu and stay home when having them. It's recommended you stay home and away from people until 24 hours after your fever breaks (100 °F or 38 °C) and are no longer taking Tylenol to reduce the fever. Attend a discussion panel with Dr. Raver, Allegany County Health Department director, and staff on Thursday, October 29, 2009 from 12:00 – 1:00 p.m. in the College Center Theatre. "Promoting Health and Preventing Disease"
CUMBERLAND, MD – Usually by this time of the year the flu season has ended in Allegany County, and influenza is not a primary health concern during the summer months. However, with the emergence of the novel H1N1 “swine” flu virus in April, this summer is turning out somewhat differently. Health care professionals continue to see patients complaining of flu-like symptoms, and influenza cases continue to be identified locally, statewide, and nationally. Although most cases of H1N1 have been mild in comparison to the regular seasonal flu, the novel virus can present a very significant danger to individuals with other underlying medical conditions. The Centers for Disease Control and Prevention (CDC) reports as of July 2 that 170 people nationwide have died after contracting novel H1N1 influenza. In the Mid-Atlantic region, Virginia has reported two H1N1 flu-related deaths and Pennsylvania has reported four. The Maryland Department of Health and Mental Hygiene (DHMH) reports that two people in the state have died as a result of complications from H1N1. Both were adults from the metro area with serious underlying medical conditions. Nationwide, as of July 2, CDC reports more than 33,902 confirmed and probable cases of H1N1 influenza. To date, 686 cases of novel H1N1 have been confirmed in Maryland. That figure is considered a fraction of the total H1N1 flu cases statewide. Many people who become ill with flu-like symptoms are not tested and recover within a week’s time, much like seasonal flu. H1N1 continues to respond to common antiviral medications that lessen the severity of illness. To date, only a small percentage of confirmed H1N1 cases have required hospitalization. Symptoms of influenza include fever, cough, and sore throat. Additional symptoms may include chills, headache, fatigue, vomiting, diarrhea or shortness of breath. Based on CDC figures, it is estimated that 1,000 Marylanders die every year from seasonal flu or its complications. Complications and death are more common among those with serious underlying health conditions. Pneumonia can be a serious complication of influenza. For that reason, the CDC recommends that all adults over the age of 65 get an annual pneumococcal vaccination. The pneumonia vaccine is also recommended for adults who smoke or have asthma or for anyone over age 2 with other serious health conditions such as heart disease, diabetes, or other chronic illnesses. The Allegany County Health Department is currently offering pneumonia vaccines on Wednesdays from 1-4 p.m. at their multi-purpose clinic at the Willowbrook Office Complex. The cost for the vaccine is $40, or Blue Cross Blue Shield patients can have their insurance billed for the vaccine. For more information about the pneumonia vaccine, contact the Health Department at 301-759-5093. If you have flu symptoms, stay home and avoid contact with other people to protect them from catching your illness. You may have heard that the World Health Organization (WHO) today announced a change in how they classify the worldwide H1N1 (swine) flu outbreak. While WHO has declared a “Phase 6 Pandemic” based on the spread of H1N1 flu across the globe, this new declaration has changed little that is being done in the United States or Maryland. As a state and a nation, our monitoring, surveillance and treatment has been at the highest possible level since this became a serious health concern in April. It is important for you to know that such a declaration does not increase or lower the health risk posed by this novel flu virus. All evidence we have seen so far indicates that H1N1 flu remains a relatively mild illness that behaves much like seasonal flu. As of today, we have confirmed 174 cases of H1N1 flu in Maryland. Fourteen (14) people have been hospitalized as a result. All individuals have either recovered or are recovering well at this time. We will likely see many more cases of H1N1 flu as the summer progresses. Nothing we have seen of this illness has been unexpected or surprising. In Maryland and across the country we have treated H1N1 flu as if it were the pandemic it has become. We have extended our flu-watch season and expanded our monitoring and surveillance capabilities to stay ahead of whatever develops. Wash your hands often, especially after coughing, sneezing, and wiping or blowing the nose. Use paper tissues when wiping or blowing your nose; throw tissues away after use. Stay away from crowded living and sleeping spaces, if possible. Stay home and avoid contact with other people to protect them from catching your illness. Below you will find some helpful information provided by the Centers for Disease Control and Prevention about the WHO declaration and, more importantly, what is currently being done to protect you now and in the future. What do the WHO phases mean? The WHO phases are based on the geographical spread of a novel influenza virus. As “pandemic” means worldwide epidemic, a WHO Phase 6 means that the virus is spreading across the globe. What the WHO phases do NOT do is predict the severity of the virus. Using a hurricane analogy, the WHO phase system simply tells us that a hurricane is imminent, but it DOES NOT tell us how big or how strong the storm might be. It is the strength of a hurricane that dictates which pre-landfall actions are needed, such as just boarding up windows versus a full evacuation. While weather forecasters can fly an airplane into the eye of a hurricane to measure a storm’s strength and predict its ultimate severity, there is no such forecasting tool for flu viruses. Does WHO’s change to Phase 6 mean the virus is more severe? No. It is important to understand that this change is based on the geographic spread of the virus to other parts of the world and does not necessarily reflect any change in the severity of the virus or associated illness. So why did WHO move to Phase 6 if the virus severity is unchanged? The move to Phase 6 is really an alert that the spread of the H1N1 virus is now expected to traverse the globe and those nations where the virus has yet to arrive should expect to eventually see cases and be prepared to respond. What does the phase change mean for the United States? What will the U.S. do differently? Here in the United States, the virus has been spreading steadily from person-to-person since April, so today’s announcement by WHO does not really change what we are already doing here at home to respond. In response to an influenza pandemic, governments, communities, workplaces and individuals will base the intensity of their efforts to reduce spread of the virus on the severity of the disease, as reflected by the number of deaths and hospitalizations from the virus. The United States has been responding to the H1N1 flu in a way that balances the health of our residents while minimizing disruption to society. We will continue to provide guidance using the most current scientific data available about the H1N1 flu. Regardless of what WHO calls or labels this, we are taking necessary and aggressive measures to protect the health of our residents out of an abundance of caution. What actions has the U.S. taken already? Since the first reports of the appearance of novel H1N1 flu in the U.S., we have been actively and aggressively implementing our pandemic response plan. We have distributed 11 million courses of antiviral drugs nationwide, we have begun the process of procuring a vaccine should it be needed, and we have been routinely providing the latest information to assist health care providers, public health officials and the public in addressing the challenges posed by this newly-identified influenza virus. Is the outbreak over in the U.S.? The only thing certain about flu viruses is uncertainty. As we have been saying for some time, we do expect that we will see more cases, more hospitalizations and more deaths from this virus. However, to date most people who have become ill with novel H1N1 in the United States have not become seriously ill and have recovered without hospitalization. While the number of cases in the U.S. may be waning, we are continuing to prepare for the possibility that the virus may return in the fall. We will continue to watch this virus carefully, especially in the Southern Hemisphere. Every day we learn more about this virus and its impact on human health. As we learn new information, we will adjust our responses and planning, and inform the public and continue to do all we can to make this outbreak less severe. Is there anything individuals can do? There are everyday common sense things that people must do to protect their health and lessen the spread of the novel H1N1 virus as well as seasonal flu viruses. Wash your hands and cover your mouth when you cough or sneeze. If you are sick, stay home, recover, and keep others well. Avoid going to work or school. Delay travel plans/. Limit your contact with others. And stay informed—be sure to visit www.hhs.gov, www.cdc.gov, and www.pandemicflu.gov to get the latest information as it becomes available. You can also call 1-800-CDC-INFO. What does Phase 6 mean for vaccine development and production? First, it is important to recognize that developing a vaccine for use, in case it is needed, is different from recommending individuals be immunized. There is a great deal still unknown, including the severity of illness caused by the virus, how the virus will evolve, how the outbreak plays out in the coming weeks to months, and what populations may be most (or least) at risk. The process of vaccine preparation is already underway and decisions regarding production will be informed by what we learn about the need for such a vaccine and what we learn about the vaccine itself as it is developed and is used in clinical studies. The goal is to have vaccine(s) ready, if needed, but this is a multi-step process and the decisions to have a vaccine ready, if needed, including, potentially, producing such vaccines on a large-scale level, is distinct from any decision to recommend its use. Are you planning an H1N1 immunization program? While we are all working as fast as possible to develop the vaccine in the event that we need it, please understand that this is separate from a decision to use it, or not. Any decisions on immunization programs must be made on the best scientific and public health evidence available at the time. That said, it is very important that we prepare expeditiously and thoroughly for all potential scenarios. Q: What is the 2009 H1N1 Flu? A: The 2009 H1N1 Flu is a novel (previously unseen) influenza A virus. It has also been referred to as “swine flu.” This new virus was discovered in Mexico in April 2009 and has since spread to the US and to several countries around the world. Q: Can I get this new flu from eating ham or other pork products? What about fruits, vegetables, or other foods imported from affected areas? A: No. This flu is contracted by coming in contact with another person who has the virus or with an infected live animal. Much like the seasonal flu, this flu spreads through droplets, such as in a sneeze or cough. This is NOT a food-borne illness. Properly handled and prepared pork products and other food items will not cause a person to contract this flu. Although the H1N1 virus is not a food-borne illness, other illnesses (such as salmonella, etc.) are, so it is always recommended that meats be cooked thoroughly and that you wash fruits and vegetables before preparing them to eat. Q: What are the symptoms of the H1N1 flu, and what do I do if I think I have it? If you are experiencing flu-like symptoms within a week of having either traveled to an area where swine flu has been identified or being in contact with someone who has traveled to one of those areas, you should stay home and call your doctor about your symptoms. Flu-like symptoms include a fever of 100°F (37.8°C) or higher accompanied by a cough or sore throat. Q: How serious is this flu? A: The main cause of concern at this point has been the fact that this is a new virus which has not previously been discovered, and it can be spread from person to person. Because this virus has not been seen before in humans, no one is immune to it. However, cases seen in the US to date have been relatively mild with only a few hospitalizations and one death (which, it was discovered, was a child from Mexico whose family sought treatment for him in the US relatively late in his illness). The fact is that the regular seasonal flu causes an average of 36,000 deaths every year in the United States. Since January, more than 18,000 people have died from seasonal flu or related complications, while only one death has occurred in the US from this new flu virus. That is not to say that the public should not be alert and proactive in preventing spread of this or any other contagious illness. Q: How can I protect myself and my loved ones from getting the flu? A: Basic hygiene and common sense go a long way in preventing transmission of the flu. Here are some things we can all do to protect ourselves and our loved ones. Disinfect commonly-handled items such as phones, remote controls, door knobs, copier or fax keypads, etc. with Lysol or another disinfectant labeled as effective in killing the flu virus and other germs. Q: What about traveling? Is it safe to travel? 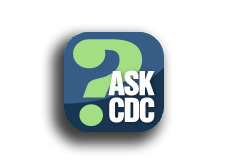 A: At this time, the CDC is recommending that individuals not travel to Mexico. When traveling outside your local community, use prudent caution, common sense, and preventive health measures as during any regular flu season. Q: Are there medications available to treat the H1N1 flu? A: Yes. CDC recommends the use of Tamiflu or Relenza for the treatment of those infected with the H1N1 flu virus and for prevention of infection in household contacts of confirmed or probable cases in high risk groups. Q: Why aren’t these anti-viral medications being given out as a precautionary measure? A: There is an ample supply of antiviral medications available to treat those who become infected with the flu. Timing of use for treatment or prevention is important and needs to be directed by your physician. The antiviral drugs, as preventive treatments, are only effective while being taken. Overuse of medication has the potential to cause resistance to the medication, making it less effective in combating illness. Medications have a limited shelf life. For all these reasons, anti-viral medications are only being prescribed to treat infected persons and those requiring preventive treatment. Maryland Department of Health and Mental Hygiene (DHMH): http://www.dhmh.state.md.us (click on pink banner for flu information). The CDC has also set up a 24/7 information hotline: 1-800-CDC-INFO. Questions can also be directed to the Maryland Department of Health and Mental Hygiene at by fax to 410-225-0378 or by e-mail at swineflu@dhmh.state.md.us. This podcast discusses ways you can protect you and your family from the H1N1 flu virus (swine flu). 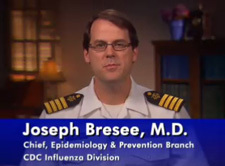 In this video, Dr. Joe Bresee, with CDC's Influenza Division, describes the symptoms of H1N1 (swine flu) and warning signs to look for that indicate the need for urgent medical attention. 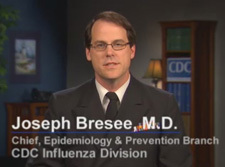 In this video, Dr. Joe Bresee, with the CDC Influenza Division, describes swine flu - its signs and symptoms, how it's transmitted, medicines to treat it, steps people can take to protect themselves from it, and what people should do if they become ill.